At around 800,000 people, San Francisco is a more manageable city than it’s fame implies; it’s much smaller and more accessible than cities like New York and L.A., and the sprawl is neatly confined to geographic-bounded corridors that make the city and surrounding areas easy to digest. A good place to start is simply by exploring the region on Google Maps. The city of San Francisco is located on a north-facing peninsula, enclosed by the open Pacific to the West and the San Francisco Bay to the East. Heading north across the Golden Gate bridge is Marin County, less populated and a gateway to the Napa and Sonoma wine regions. Directly east is the East Bay, home to Oakland and Berkeley. Heading southeast along the water’s edge is Silicon Valley, capped off by the city of San Jose. Getting oriented within San Francisco is a bit more challenging. The city’s hilly terrain, numerous (and ever expanding) neighborhood delineations, and irregular street naming scheme can make it hard to figure out where you want to be and how to get there. 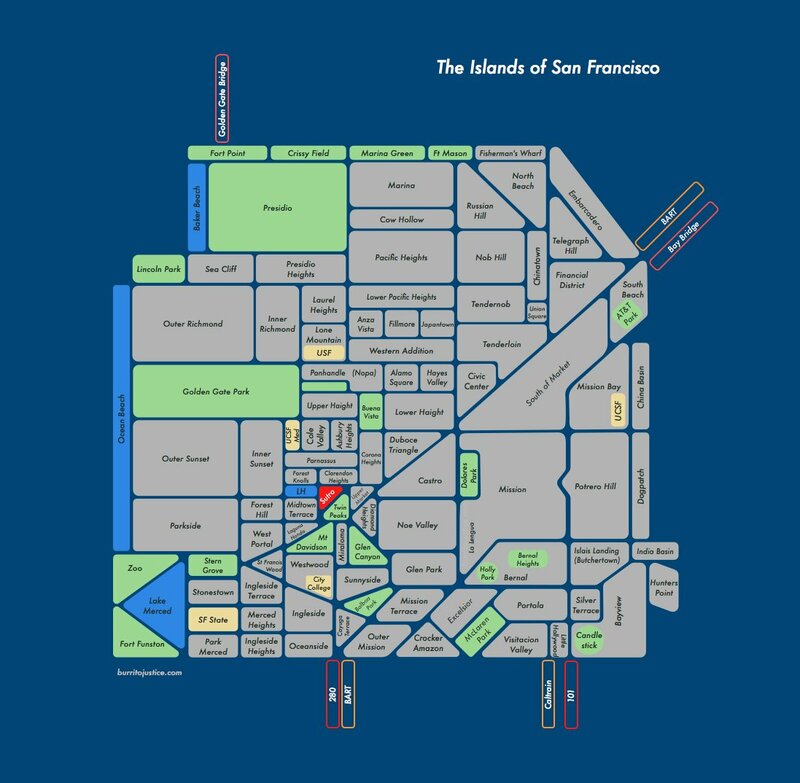 A simplified but effective way to locate the SF neighborhoods is with this map: The Islands of San Francisco. (Lots more interesting info on how the map was imagined, designed, and revised here). For descriptions of San Francisco neighborhoods, there are many useful guides online: The SF Gate guide is categorized into things to do, restaurants, shopping, etc; The Bold Italic’s guide gives an irreverent portrait of the neighborhoods and where you’ll fit in; AirBnB offers a succinct picture of the neighborhoods geared toward tourists. But the best way to understand by the city is by exploring it! More to come on that soon.